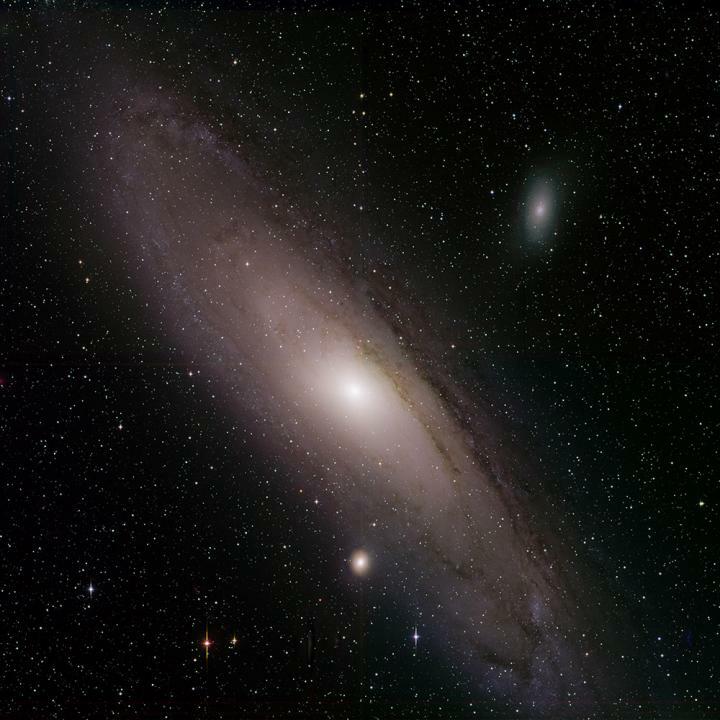 The results are rolling in from Caltech’s newest state-of-the-art sky-surveying camera, which began operations at the Palomar Observatory in March 2018. Called the Zwicky Transient Facility, or ZTF, the new instrument has so far discovered 50 small near-Earth asteroids and more than 1,100 supernovae, and it has observed more than 1 billion stars in the Milky Way galaxy. One of the near-Earth asteroids discovered by ZTF, called 2019 AQ3, has an orbital period of just 165 days, the shortest known “year” for any asteroid. ZTF uses the 48-inch Samuel Oschin Telescope at Palomar to survey the northern skies for anything that explodes, moves, or changes in brightness. Because the ZTF camera covers 240 times the size of the full moon in a single night-sky image, it is discovering the most fleeting, or short-lived, of cosmic events, which were impossible to catch before now. The cost to develop and run ZTF is about $24 million, with about $11 million of the funding coming from the U.S. government via the National Science Foundation (NSF) and the rest coming from an international collaboration of partners. Additional support comes from the Heising-Simons Foundation, along with Caltech itself. Because nearly half of ZTF is paid for by the U.S. government, nearly half of its observations are shared publicly in near-real-time with the astronomy community. When varying, or transient, objects are detected, an automated alert system is activated, sending notices out to astronomers, who then quickly follow up on notable objects of interest using other telescopes, including the 60-inch and 200-inch Hale telescopes at Palomar. An NSF-funded program called GROWTH, with 18 international observatories in the Northern Hemisphere, also follows up on the ZTF alerts. All data from the ZTF camera are sent via a microwave network managed by UC San Diego to IPAC, an astronomy center at Caltech that processes and archives up to 4 terabytes of data each night. “This is the first time IPAC has generated real-time alerts from a survey and the first time a survey has made public up to hundreds of thousands of alerts per night,” says George Helou, ZTF co-investigator and executive director of IPAC. Ultimately, the detailed data are also made available to astronomers around the world through IPAC. “It takes only 10 to 20 minutes from the time a transient observation is made to the time the alert goes out,” says Matthew Graham, the ZTF project scientist at Caltech. Graham specializes in “big data,” and specifically how to handle and process large streams of astronomical data. “It’s like running a major newsroom. We’ve never operated at this scale before, and handling all the data is quite a feat,” he says. Discoveries from ZTF so far include not only new supernovae, binary stars, and asteroids but two black holes caught shredding stars. As stars wander too close to black holes, they can be “tidally disrupted” by the gravity of the black hole and stretched into oblivion. Graham says that he and the team working on the tidal disruption data, led by Suvi Gezari of the University of Maryland, got fed up with referring to the technical names for the objects, consisting of long strings of numbers. “We decided to nickname them Ned Stark and Jon Snow, after Game of Thrones characters,” he says. ZTF also caught two near-Earth asteroids, 2018 NX and 2018 NW, that zipped by Earth at distances of only 72,000 miles and 76,000 miles away, respectively, or approximately a third of the distance between Earth and the moon. These discoveries were enabled by the NSF-funded GROWTH program. On January 4, 2019, ZTF caught the near-Earth asteroid 2019 AQ3. “This is one of the largest asteroids with an orbit entirely within the orbit of Earth–a very rare species,” says Quanzhi Ye, a postdoctoral scholar at IPAC who first spotted the asteroid in the ZTF data. Tom Prince, one of the co-investigators of ZTF and the Ira S. Bowen Professor of Physics at Caltech, says that the instrument is particularly adept at identifying new gravitational-wave sources–in particular, pairs of compact stars like white dwarfs–that will be observed with future space-based gravitational-wave detectors. ZTF is also laying the groundwork for the future NSF-funded Large Synoptic Survey Telescope (LSST), which will, in every exposure, scan a volume of sky 13 times larger than that scanned by ZTF. LSST is scheduled to begin operations in 2022. “The same alert techniques that ZTF is developing for international networks of observatories to follow up on its findings will be applied to LSST when it joins the search,” says Kinney. The newest ZTF papers are: “The Zwicky Transient Facility: System Overview, Performance, and First Results,” led by Eric Bellm of the University of Washington; “The Zwicky Transient Facility: Science Objectives,” led by Graham; “The Zwicky Transient Facility: Data Processing, Products, and Archive,” led by Frank Masci of IPAC; “Machine Learning for the ZTF,” led by Ashish Mahabal of Caltech; “The Zwicky Transient Facility Alert Distribution System,” led by Maria Patterson of the University of Washington; “The GROWTH Marshal: A Dynamic Science Portal for Time-domain Astronomy,” led by Mansi Kasliwal of Caltech; and “A Morphological Classification Model to Identify Unresolved PanSTARRS Sources: Application in the ZTF Real-Time Pipeline,” led by Yutaro Tachibana of Tokyo Institute of Technology and Caltech and Adam Miller of Northwestern University and the Adler Planetarium.